Sandia has been selected to lead two projects and support three others funded by the U.S. Department of Energy Cybersecurity for Energy Delivery Systems program to enhance cyber security for the grid and oil and natural gas infrastructure. The first project, Containerized Application Security for Industrial Control Systems, will increase the availability and resiliency of control systems by dynamically migrating, updating, and restoring critical computer applications in real time. The second Sandia-led project, Survivable Industrial Control Systems, will proactively detect and appropriately respond to threats to power system equipment while sustaining critical energy delivery functions. As a result from the recent Resilient Distribution Systems Lab Call with the Grid Modernization Laboratory Consortium (GMLC), the DOE Grid Modernization Initiative has chosen Sandia to lead a 3-year project, “Designing Resilient Communities,” beginning in December. Together with electric utilities and other partners, Sandia will work to solidify a framework for community resilience planning focused on grid modernization and investment involving key stakeholders in the community. In addition, Sandia will play a key role in two other GMLC demonstration projects: “Resilient Alaskan Distribution System Improvements using Automation, Network Automation, Network Analysis, Control, and Energy Storage (RADIANCE)” and the “Laboratory Valuation Analysis Team”. Sandia joined a team of DOE national labs and universities in the U.S. and Europe to demonstrate the use of power hardware-in-the-loop (HIL) capabilities located at each institution to conduct a distributed real-time simulation of a power systems. During this exercise, Sandia simulated the behavior of a distribution network with a large amount of embedded photovoltaics (PV). The PV generation was represented with actual power hardware (e.g., an inverter) located at Sandia’s Distributed Energy Technologies Laboratory. The Real-time Superlab Demonstration was led by Idaho National Laboratory and included the National Renewable Energy Laboratory, Colorado State University, University of South Carolina, Washington State University, RWTH Aachen University in Germany, and Politecnico di Torino in Italy. This linkup demonstrated the feasibility of a multi-site, real-time simulation of the electrical grid, by exchanging secure high-speed data among research institutes. This ability creates new capabilities, increases opportunities for collaboration, and makes research infrastructure investment more cost-effective. As one of five Technology Commercialization Fund projects awarded to Sandia, WattJoule will test Sandia’s membranes for use in vanadium redox flow batteries. Previous lab scale experiments at Sandia have shown that a new membrane has better performance and the potential for much lower cost. This large-scale test by WattJoule will evaluate performance at scale, thereby giving industry verification so commercialization can accelerate. Vanadium redox flow batteries are best suited for applications that require storing large amounts of energy, such as time-shifting renewable generation or load. Under a 3-year laboratory directed research and development project, Sandia established virtual power plant (VPP) software—a cyber-resilient, real-time communications system—to provide utilities with greater capability to perform voltage/frequency regulation and respond to grid disturbances. The concept of the VPP refers to a collection of resources and power circuits that are under a coordinated control as an entity that can respond to commands and behave as a controllable and dispatchable resource. The first report describes the design and evaluation of a secure VPP, while the second report details full state feedback control. Earlier this Fall, EPB energized a 100kw/400kWh Vanadium Redox Flow Battery as part of a GMLC project led by Sandia. The battery will be used for solar integration, voltage regulation, back-up power, advanced microgrid operations, and energy management. Sandia will analyze the data generated from the system to identify the value streams for each potential application to optimize utilization. Sandia’s Abraham Ellis, manager of Renewable and Distributed Systems Integration, provided an overview of energy resilience research during the webinar “Energy Resilience in the Americas: Frameworks, Tools, Applications and Experiences in Reinforcing Energy Systems in the Americas”. This event, which took place on August 29, was organized by the Clean Energy Solutions Center and the Energy and Climate Partnership of the Americas (ECPA) Technical Coordinating Unit at the Organization of American States. It was part of a U.S.-led effort to disseminate critical infrastructure resilience best tactics. Representatives from Argonne National Laboratory and energy agencies in Mexico and the Dominican Republic also participated in the webinar. Sandia's Dan Borneo, program lead for Energy Storage Demonstration Projects, participated in a webinar on October 24 to discuss solar+storage solutions for short-term resilience and recovery in natural disasters, including current efforts in Puerto Rico and past efforts in Florida and the Northeast. The webinar was hosted by the Clean Energy States Alliance and included panelists from the DOE Office of Electricity Delivery and Energy Reliability, SunTree Consulting, Solar Energy Industries Association, and Sonnen. During the week of October 9th, 150 attendees gathered at the Annual DOE Energy Storage Peer Review and 10th Biennial Electrical Energy Storage Applications and Technologies (EESAT) Conference in San Diego, CA. 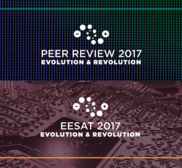 The Peer Review evaluated 47 posters of projects funded by the program while EESAT celebrated 20 years of the international conference bringing together researchers and professionals from national laboratories, universities, and industry. On Friday the 13th, a tour of the University of California San Diego Microgrid guided attendees through the 47MW peak load microgrid at the Center for Energy Research. Presentations and posters from the event are available on the event website. Four innovations from Sandia’s Energy programs have been named as 2017 R&D100 award winners, including three that support a more resilient, reliable grid: The Microgrid Design Toolkit is a decision support software for microgrid designers in the preliminary design phase that provides optimal trade space characterization; the Control System for Active Damping of Inter-Area Oscillations enhances power grid reliability, leading to higher power transfers; and Ultra-Wide-Bandgap Power Electronics yield order-of-magnitude improvements in size, weight, power, and switching speeds in electrical power devices. The IEEE Albuquerque Section has recognized David Schoenwald as a 2017 Outstanding Engineer for his contributions to the development and realization of next-generation smart grid technologies. David is the principal investigator for a project on wide-area damping control for Bonneville Power Administration—a project aimed at reducing wide-area power oscillations to help prevent blackouts and provide more cost-effective options for utilities. The technology used for this project was one of the three R&D 100 award winners listed above. Barkholtz, H.M., Fresquez, A., Chalamala, B.R., and Ferreira, S.R., “A Database for Comparative Electrochemical Performance of Commercial 18650-Format Lithium-Ion Cells,” J. Electrochem. Soc., vol. 164, no. 12, pp. A2697-A2706, September 2017. Byrne, R.H.; Nugyen, T.A. ; Copp, D.A. ; Chalamala, B.R. ; Gyuk, I. “Energy Management and Optimization Methods for Grid Energy Storage Systems,” IEEE Access, vol. PP, no. 99, pp. 1-30. August 2017. Guo, Z.M. ; Chen, R.L.Y; Fan, N.; Watson, J.P. “Contingency-Constrained Unit Commitment with Intervening Time for System Adjustments,” IEEE Transactions on Power Systems, vol. 32, Issue: 4, pp 3049-3059, July 2017. Safta, C.; Chen, R.L.Y. ; Najm, H.N. ; Pinar, A.; Watson, J.P. “Efficient Uncertainty Quantification in Stochastic Economic Dispatch,” IEEE Transactions on Power Systems, vol. 32, Issue: 4, pp 2535-2546, July 2017. Small, L.J. ; Eccleston, A.; Lamb, J.; Read, A.C.; Robins, M.; Meaders, T.; Ingersoll, D.; Clem, P.G. ; Bhavaraju, S.; Spoerke, E.D., “Next Generation Molten NaI Batteries for Grid Scale Energy Storage,” Journal of Power Sources. 360, 569-574, August 2017. Stenclik, D., Denholm, P., and Chalamala, B. "Maintaining Balance: The Increasing Role of Energy Storage for Renewable Integration," in IEEE Power and Energy Magazine, vol. 15, no. 6, pp. 31-39, November - December 2017.